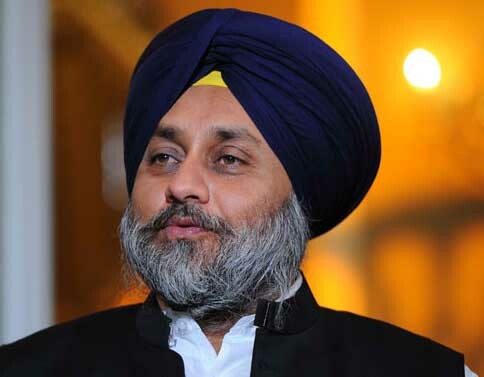 Amritsar, December 5: Punjab Deputy Chief Minister Mr. Sukhbir Singh Badal today said that Aam Aadmi Party has committed fraud with the people of country and exposed itself as organized gang of looters who were bent upon robbing the exchequer in a well planned way by misusing the tag of Aam Aadmi. Questioning the four fold increase in the salaries of MLAs, Mr. Badal said Mr. Kejriwal should explain its rationale and also explain to the country appointment of an army of 57 Chief Parliamentary Secretaries and Chairmen with all facilities of cabinet ministers. He said people of Delhi were stunned by the anti-people postures of AAP including four fold rises in VAT in Delhi. He said AAP had backstabbed the countrymen by exploiting their sentiments. Mr. Badal was here to pay obeisance at Golden Temple along with his wife and Union Food Processing Minister Mrs. Harsimrat Kaur Badal. They also listened to the chants of hymns. After paying obeisance while referring to a media query Mr. Badal said it was strange that a Party claiming to a party of common man was indulging in practices, which were strongly opposed by it before elections. He said AAP had forgotten its pre-elections commitments and now it was all out to loot state exchequer, using red beacons and all privileges. He said people of the country would not forgive AAP for misusing the tag of Aam Aadmi and betraying middle class sentiments. He said the people of Punjab had already rejected AAP and no theatrics could revive the fortunes of the party. Answering a query regarding appointment of PPCC Chief Captain Amarinder Singh, Mr. Badal said the Congress was facing bitter infighting in the party even before the coronation of Captain. He said that the façade of unity of Congress could not survive and Captain could not befool people of Punjab with his so called bold statements as nobody in Punjab wanted return of black days of his misrule. Mr. Badal said if Captain was a true Sikh he should seek justice for the 1984 Sikh massacre and ensure punishment to Congress leaders Jagdish Tytler and Sajjan Kumar. He said Amarinder should first insist on expulsion of both leaders from Congress Party. He said that empty promises and boast would be credible only if Captain was successful in getting these two leaders expelled from the Congress Party. When asked about the ongoing series of Sadhbhawna Rallies in the state, Mr. Badal said that this Sadhbhawana campaign was going well and the huge number of people gathering over there was evident enough that people of Punjab wanted peace, unity and communal harmony. He said issueless oppositions were working day and night to criticize the ruling alliance. On being asked about the 2017 polls, Mr. Badal said the ruling SAD-BJP alliance would not only secure impressive win in the ensuing polls but too in 2022 and 2027 since there was no alternate of development agenda of ruling combine. When asked about the rally announced by them at Patiala, Mr. Badal said that as per the revised schedule now rally will be held in Patiala on 15 December parallel to the gathering of Congress at Bathinda.